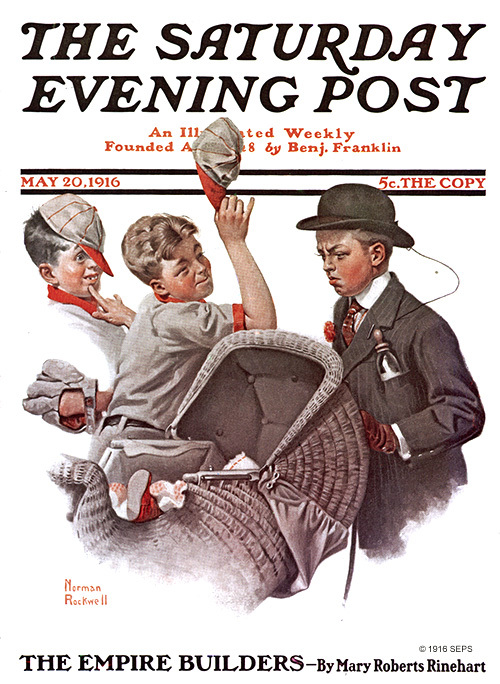 One hundred years ago today, May 20, 1916, Norman Percevel Rockwell (1894-1978) took a great leap forward in his life-long march to take his place among great American artists, with his first Saturday Evening Post cover, usually called “Boy With Baby Carriage” a.k.a. “Mother’s Day Off” a.k.a “Salutation” a.k.a “Home Duty”. 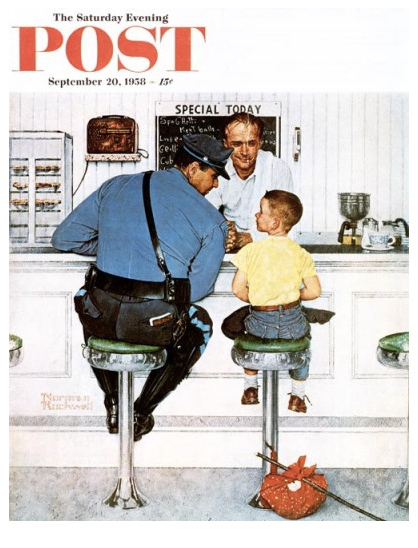 Aged only 22 when he reached this pinnacle of illustration — the Post had about two million subscribers — Rockwell was already a successful illustrator, having dropped out of high school to attend art school instead. He was called “The Deacon”, he took his studies so seriously, and he quickly won a reputation as “The Kid With the Camera Eye”. 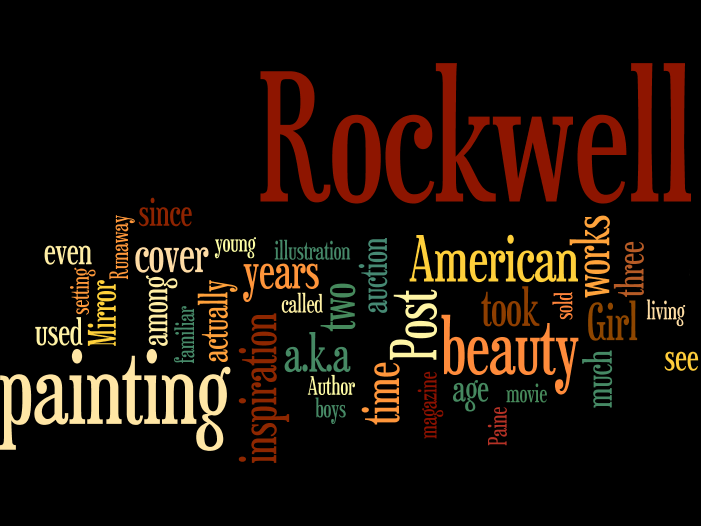 Over the next 47 years, Rockwell would paint about 320 covers for the Post. (The count varies from source to source, from 317 to 324.) His last, a portrait of Pres. John F. Kennedy, was published on December 14, 1963 (a “rerun”, though, of the October 29, 1960, cover). Many of these works have become familiar tokens of an idyllic life that, even when they were current, beckoned to a time already past, such as “No Swimming” (1921). 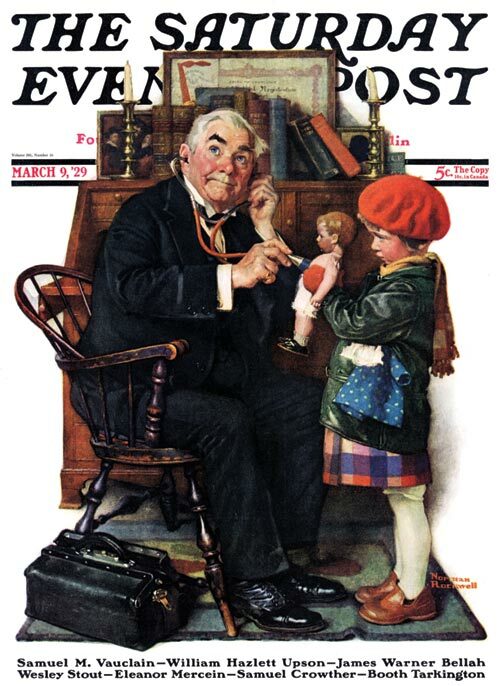 And some of the covers have become familiar iconic representations of aspects of American life, such as “Doctor and Doll” (1929) and “The Runaway” (1958). 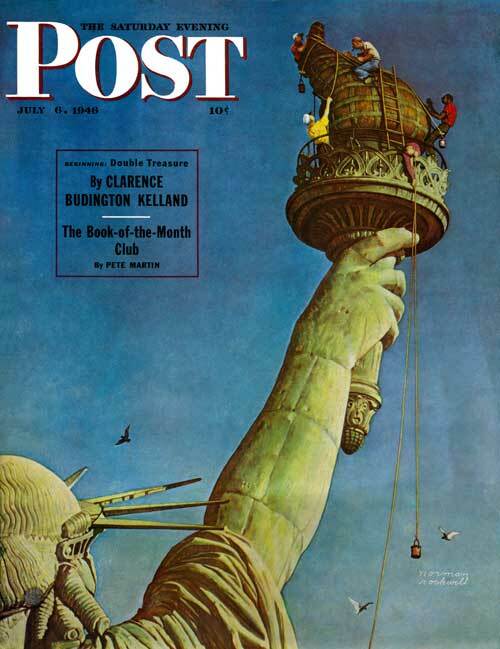 The original oil painting of one cover, “Working on the Statue of Liberty” (1946), now belongs to the White House and hangs on the wall, at least from time to time, in the Oval Office. 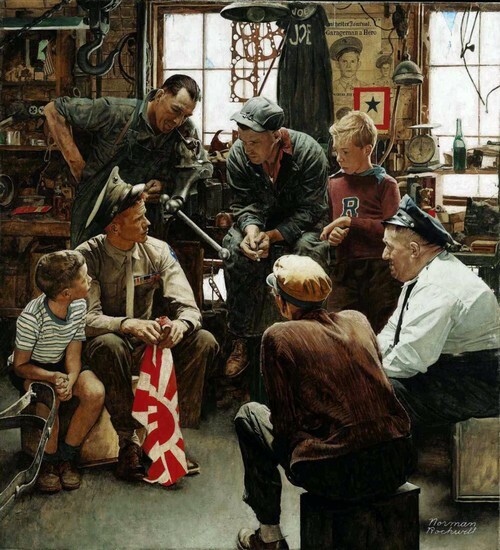 Rockwell was never satisfied with his work, though: he was always studying other artists, thinking about and experimenting with ways to improve his own craft. (He even took a drawing class in the 1960s!) He took another giant leap forward as he neared and passed his half-century mark: some of his greatest works from the 1940s and 1950s are masterpieces of rich, subtle, evocative beauty. Here are a half-dozen of my favorites. In “The Homecoming Marine” a.k.a. “The War Hero” a.k.a. 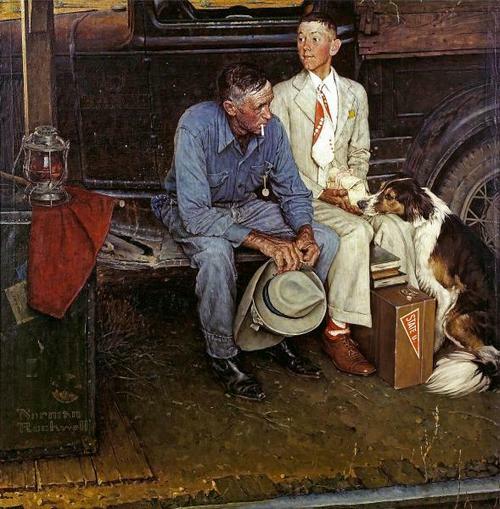 “The Storyteller”, the boys are two of Rockwell’s sons (Jarvis, the eldest, and Peter, the youngest), and the setting is Bob Benedict’s garage in Arlington, Vermont, where the Rockwells were living at that time. Nicholas Provenzo examines this painting in Five Great American Paintings, Part II. Widely considered to be his greatest achievement, “Shuffleton’s Barbershop” was, indeed, a real place in East Arlington, and its proprietor, Rob Shuffleton, was Rockwell’s barber. This painting is the inspiration for a 2013 movie, and some see William Sidney Mount’s “The Power of Music” (1847) as Rockwell’s own inspiration. 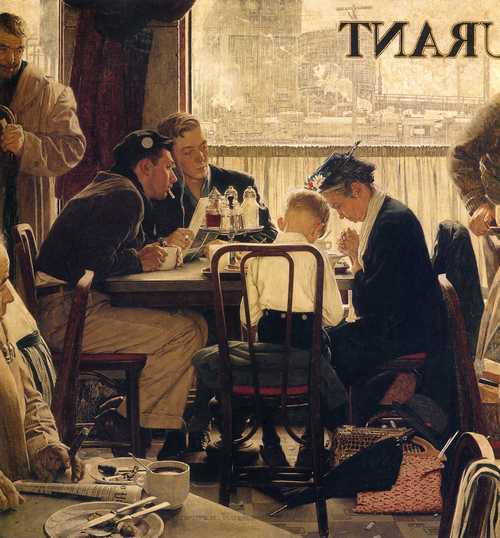 His most popular Post cover, “Saying Grace” was an idea submitted to Rockwell by a correspondent who had witnessed something similar. Jarvis Rockwell was the model for the young man with the cigarette in his hand; the elderly woman did not live to see the finished painting. 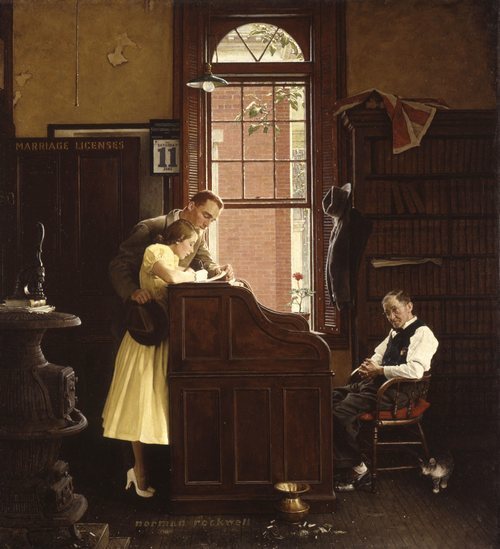 The Post paid Rockwell $3,500 for “Saying Grace”, which sold at auction in 2013 for $46,000,000 — reportedly the highest price ever paid for a painting at an American auction. 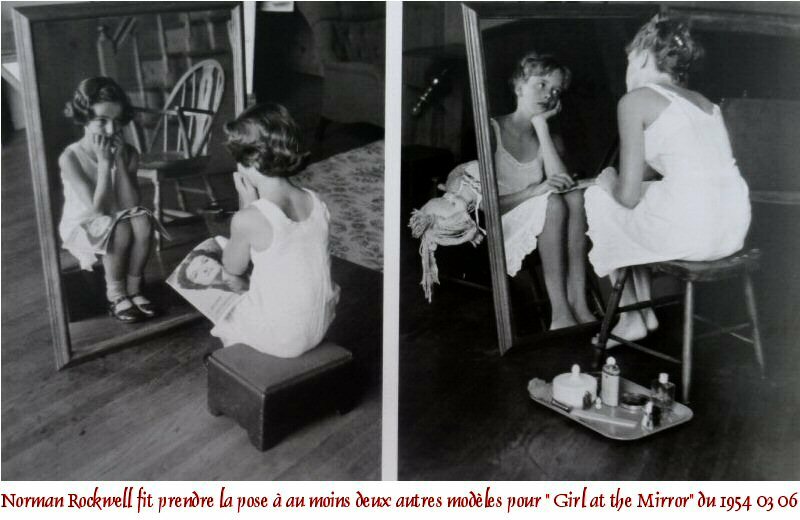 Mary Whalen, the daughter of Rockwell’s attorney, was chosen for “Girl at Mirror” from among several models photographed beforehand; she had already been used in “Day in the Life of a Girl” (1952) and “Girl With Black Eye” a.k.a. “The Shiner” (1953). 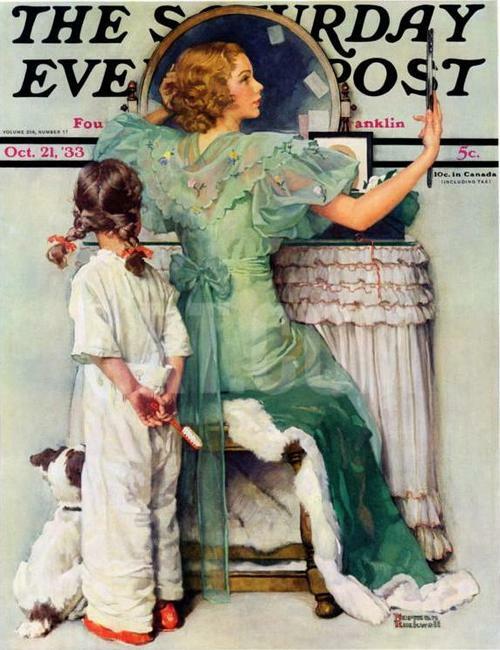 Rockwell later regretted including a recognizable face (actress Jane Russell) on the magazine page. Rockwell traveled all the way to New Mexico to photograph the truck and railroad stop for “Breaking Home Ties”. 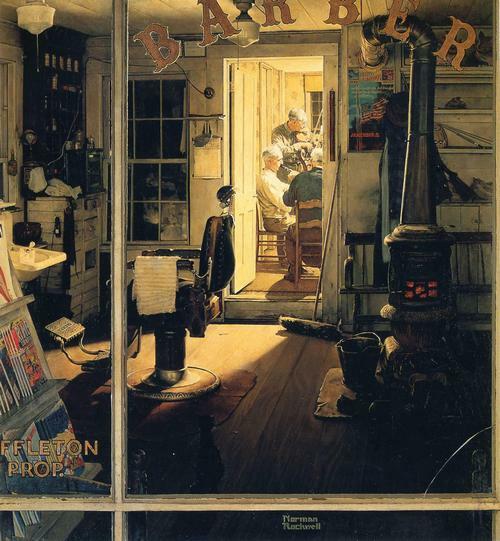 Earlier versions of the composition included the mother and had the figures seated on a bench; the unwitting display of a “third-rate replica” of this painting for nearly three years in the Norman Rockwell Museum caused much consternation until the original was discovered hidden inside a wall. This painting was the inspiration for a 1987 movie and, having been bought in 1960 for $900, sold at auction in 2006 for $15,400,000. The setting for “The Marriage License” was the town hall in Stockbridge, Massachusetts, where the Rockwells were then living. The young couple were actually engaged, and the elderly gentleman, Jason Braman, had recently lost his wife. 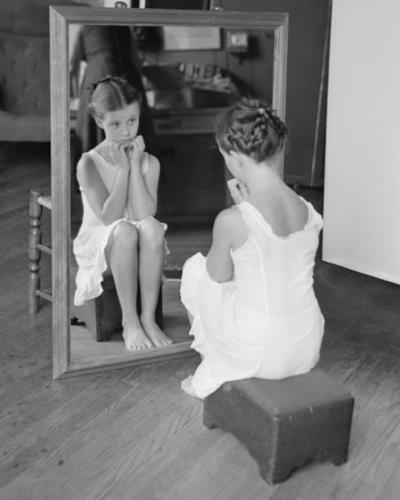 Looking again at “Girl at Mirror”, here are three images that, combined, show the maturation of Rockwell’s artistry and his use of his materials. First, a different treatment of a similar theme two decades earlier, in 1933’s “Going Out” a.k.a. 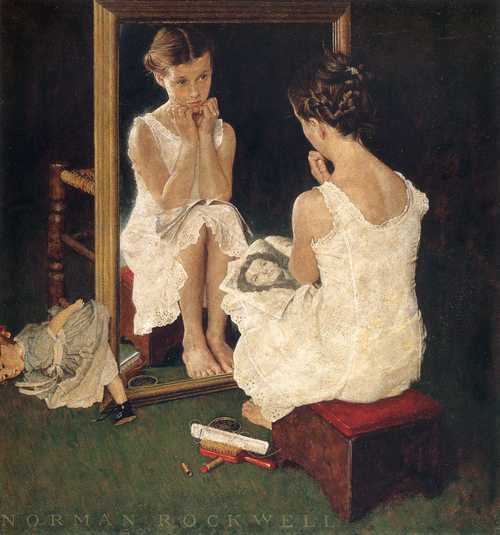 “Vanity Mirror”; next, a photograph taken of Mary Whalen at Rockwell’s direction; and, finally, the finished 1954 painting, which includes elements (doll, make-up, magazine) from photographs of other models. P.S. 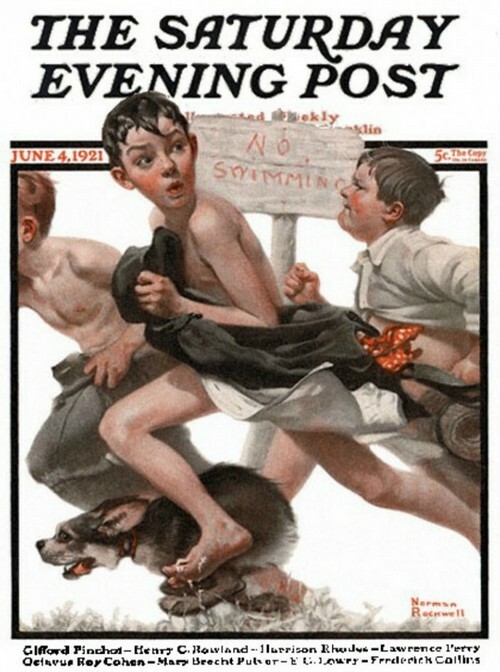 Just two days ago, Wednesday, May 18th, a Rockwell Post cover sold at auction for $4.7 million.